100% Financing Available! 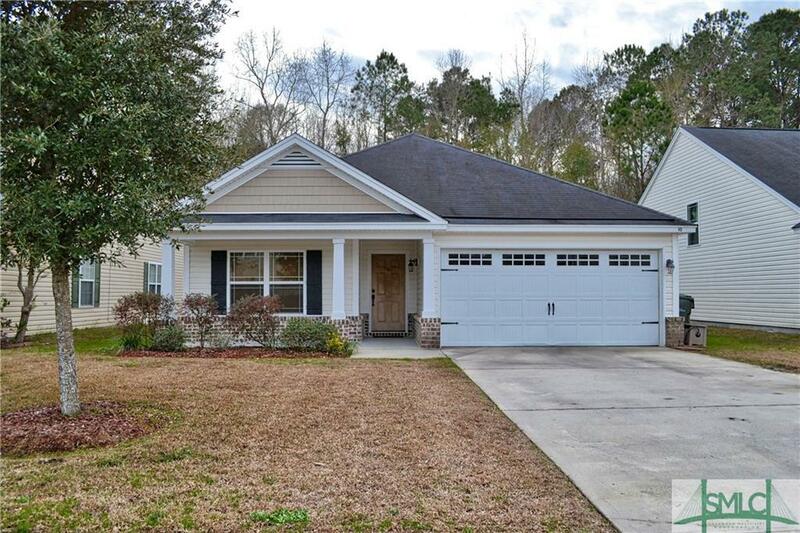 This Expertly updated and Meticulously maintained 3 bedroom, 2 bath home is better than New! Freshly painted, New laminate flooring, carpet, and light fixtures throughout. The Amazing master suite has an adjoining sitting area that is perfect for an office or nursery or could be easily converted back into a 4th bedroom. Master and guest bathrooms have wood plank accent walls and industrial style hardware. Kitchen features Stainless appliances, tons of countertop space, breakfast bar & dining area. The open floor plan with the huge great room and the airy kitchen is perfect for entertaining. A convenient laundry room and pantry off the kitchen leads to the outside covered back porch overlooking the tree lined backyard. Neighborhood amenities include clubhouse, junior Olympic size pool, beach entry wading pool, playground & a lake w/ boat ramp (non-motorized boats). No flood insurance required. Minutes to I-95, Pooler, Gulfstream, GA Ports and Savannah. Listing courtesy of Dianne G. Dunford of Re/Max 1st Choice Realty. © 2019 Savannah Multi-List Corporation. All rights reserved.